Langanes Air Station (ADC/NATO ID: H-2/H-2A) is a closed United States Air Force General Surveillance Radar station. 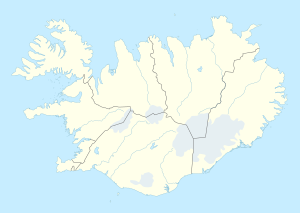 It is located 265 miles (426 km) northeast of Naval Air Station Keflavik, Iceland. The new station (H-2A) was closed on 28 June 2006 as part of the closure of United States military facilities in Iceland. Langanes Air Station (H-2) was established in 1951, shortly after the return of United States military forces to Iceland. The site was operated by the 667th Aircraft Control and Warning Squadron, and was equipped with AN/FPS-3 and AN/FPS-20 radars. The Greenland, Iceland and United Kingdom air defense sector, better known as the GIUK gap, was routinely utilized by the Soviet Union's long-range heavy bombers and maritime reconnaissance platforms as a transit point towards the Atlantic Ocean. From bases located at Archangel and Murmansk, Soviet aircraft would stream down to the North Cape in Norway towards the Gap which was use as a doorway to the vast Atlantic. Most of the Soviet missions were destined to probe United States’ air defense along the North Atlantic and after 1960 in the Caribbean where Cuba, the USSR’s most important satellite state outside continental Europe, was located. Such was the perceived threat from the Soviet incursions that it became a priority for NATO to demonstrate to that the strategic Giuk passage would be monitored at all times. In 1992 "Langanes Air Station" was re-opened at a new site (H-2A) at Gunnolfvikursfjall, located a few miles to the southwest on a cliff along the coast. the 667th Air Control Squadron operated an AN/FPS-117v5 radar from that site until 2006, when the station was closed. The original H-2 site today is abandoned, long since left to the elements. Some foundations remain however the location is desolate and windswept. The AN/FPS-117 radar tower remains at the H-2A site, but it is unused.